I've always wanted to make a cheese soufflé. Maybe it's the fantasy of channeling my inner Ina Garten...I'd have a few people over for lunch out in the garden on a beautiful sunny day...there'd be a big charcuterie board and I'd serve cheese soufflé and a great big green salad. Then, we'd make ice cream sundaes for dessert. It's a funny image but for various reasons - probably because we already know how amazing sweet dessert ones are - I've wanted to try a savory soufflé. I am finally checking it off my bucket list and honestly, it turned out so tasty that I may well be making it more often than I would have imagined before having tried it. This gruyere cheese soufflé is cheesy, nutty, and eggy. It's fluffy and light. To me, it's like the flavor of the best homemade cheese cracker in soft, pillowy form. A simple salad (and maybe a glass of crisp white wine) is the perfect accompaniment to it. I followed this Judith Jones recipe via Martha Stewart for a single-serve cheese soufflé. I will likely have to double-up the recipe in the future because even our 10-year old liked it, and frankly, I hadn't anticipated sharing with him. I can picture making this in the morning and serving it for breakfast with some plain multi-grain toast, and a strip of bacon! I did make this for lunch but we didn't sit in the garden. It's been hot lately and I'm content to stay indoors when the sun is blazing and I can just enjoy the sunlit view from the cool of my dining room. However you eat it though, I highly recommend you try it. It was better than we expected! You may know how much I like a small-batch recipe and this is one of those. It's a great way to sample something for the first time or when you just don't need a big portion. This soufflé is rich enough in flavor for two to share if you're having salad or other things with it for a meal. That said, it is very easy for one person to polish off so double-up if necessary. A very important thing is to get your hands on some good cheese. I went with gruyere but you can use an aged sharp cheddar or Swiss cheese as well. You need a packed 1/3 cup, which is roughly 1.25 ounces. The portion you end up with fits a 4 x 2 3/4 inch ramekin perfectly. Coat the ramekin with some butter and dust it with a spoonful of parmesan cheese. There are two components to put together, essentially: a white sauce, made with just a couple teaspoons of butter, a tablespoon of flour, milk, and an egg yolk; add a pinch of salt and paprika (for a little color) and that's all there is to it. The second component is 2 egg whites, whipped until it reaches a soft peak. The 2 components, along with the grated cheese, get folded together. Be sure to place your filled ramekin on top of a small baking sheet. There is the chance of overflow while baking. Mine spilled over a bit during baking and the baking sheet made cleanup a non-issue. Place your soufflé in a hot 425 degree oven but immediately lower it to 375 degrees. In less than 20 minutes, you have this puffy cloud of golden goodness you see here. For some reason, I always love the image of serving a cheese soufflé, scooping it out and divvying it up. As you can see, the soufflé is pretty sturdy. I think I just need a bigger soufflé next time so there's more to go around! My husband was saying that he can't decide which part of the cheese soufflé he likes more - that golden, somewhat firmer top, or the fluffy soft center. I have to agree...it's all good so I really think individual servings are the way to go where you can have every bit. We scraped up this one quickly and I'm glad I have more gruyere cheese in the fridge! We just might be having this for lunch (or breakfast, or dinner) again soon! Butter the inside of a 4 x 2 3/4 inch ramekin and coat it evenly with Parmesan cheese. Set the ramekin on top of a small sheet pan (in case of spill-over during baking, you'll be thankful for the baking sheet). Preheat oven to 425 degrees with a rack in the middle position. In a small saucepan, melt the 2 teaspoons of butter over low heat. Add flour, and cook, whisking constantly, for 1 minute. Remove pan from the heat and carefully add milk, whisking vigorously to combine. Return the pan to a low heat and cook, whisking constantly, until thickened. Season with salt and paprika. Remove pan from the heat, let cool a minute, then whisk in the egg yolk. Place egg whites in a medium bowl and whisk until soft peaks. Add a dollop of the egg whites and half the grated cheese into the saucepan, folding to combine. Gently fold in the remaining egg whites and cheese. Scrape into the prepared ramekin, smoothing the top. Place baking sheet with ramekin into the oven. Immediately turn the oven temperature down to 375 degrees. Bake until soufflé has risen and the top is lightly browned, about 18 minutes. Remove from the oven and serve immediately. A green salad is a great accompaniment. My hero! I've always wanted to make a souffle and the imagine you describe is pure joy to me! The wine and salad would be perfect. A soft cheese cracker? Wow I have to give this a try. So glad you provided a single serve recipe - I'm going to take it out for a spin. Thank you so much Monica. Stay cool and have a lovely weekend! I hope you give it a try when your kitchen is up and running. 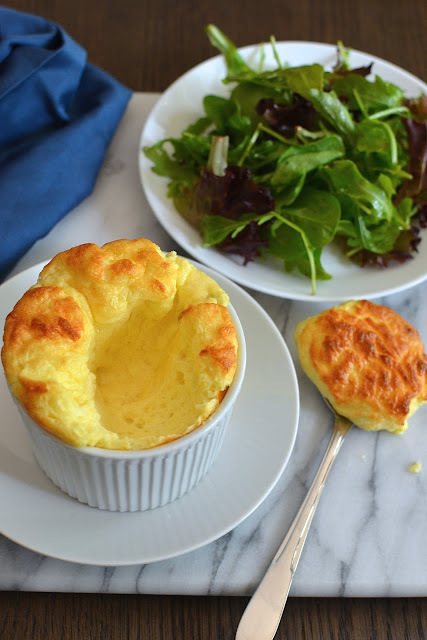 I think you would love this savory cheese souffle! Thanks and have a great weekend ahead, Tricia. OMG! Look at how light and fluffy that looks. Always wanted to make souffle. Very inspired after your post:) Love it!! WOW! I have never tried this before but definitely going to try this out soon. Looks so fluffy and yummy. Thank you for such a lovely share :-) Have a great weekend! I hope you do! It's quite tasty, I found out! This looks so light, fluffy and perfect, Monica! I've never attempted a souffle before (too scared haha) and you always inspire me with yours :) The Parmesan and gruyere cheese sound fantastic I love that you made a smaller batch! Yes, I love gruyere and dusting the dish with Parm is fun! : ) Hope you have a great weekend coming up, Kelly! So beautifully golden brown and fluffy...the best part is that golden topping! Boy Monica, you are the master of sweet and savory souffles, this one looks so light and airy. This would be a big hit at our house as we are big fans of cheese. You're too kind, Cheri. I think you would love to make this and eat it outside with your husband! : ) Hope you're enjoying some sunshine right now. 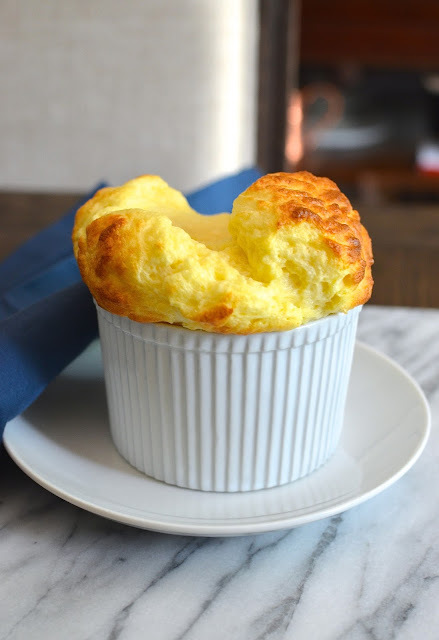 Wow Monica, the cheese souffle looks fabulous, so light and fluffy...I am so afraid to make them, fear that they will not rise or fall apart...I am saving the recipe...thanks! Hi Juliana - thank you. This would be a breeze for you, I'm sure. Hope you get a chance to try it, like I finally did! Yay! I need to get the right size ramekins so I can try this! I've always wanted to make a souffle but didn't have the right tools to do it :) Great job on these! This looks amazing! I made a cheese souflee before and it didn't look anything like yours! Such a classic dish. I'm sure yours was delicious! Thank you, Caroline. This is such an intriguing post, Monica. I love soufflé but never heard of cheese soufflé before. And I love dishes like this that are easy to put together, and easy. Such a wonderful combo of flavors. Perfect for summer. Thanks for share. Glad to hear it. I have wanted to make a cheese souffle for a long time but I remember when I first heard of it, I was amazed that it would still rise with something as "heavy" as cheese in it...definitely works and is very tasty. It looks absolutely wonderful, I've never had the courage to try making a souffle until now, but I would really like to. I would love to channel an inner Ina Gartin too! I've never attempted a scuffle of any kind and these look absolutely superb! Well done! It was very delicious, thank you! This sounds amazing! I'm pretty sure I've got one of these in my future too! Fabulous Monica! So light but rich in flavour. A great way to use excess eggs and cheese. Love the photos too - soufflé has to be one of the trickiest foods to photograph, great job! Hope you are well. Thank you for the kind words, Kiran. Your souffle is making my mouth water! I love cheese souffle! Monica, these are beautiful! I'm craving for something savory right at this moment. I can't wait to dig into these salty and cheesy soft clouds. I think you would love these! I still daydream about this one and want another one soon.